By listing out what you need to accomplish, you can start to schedule your plan-of-attack. Chances are, if you simply try to remember your to-do list mentally, you will forget some— if not all— of what you need to do. Then, you’ll sporadically remember items from that to-do list at times when you may not be able to complete the tasks conveniently— thus, creating a cycle of procrastination. To create an effective to-do list, start by listing out each project. Then, order the projects from highest to lowest priority and include the due date for each one. Finally, list out the individual steps or tasks required to complete each project. You can begin to make a list of steps you need to take to prepare for your next SAT or ACT by writing down practice test assignments, dates of tutoring sessions, registration deadlines, and test dates. After making a list of what you need to do for SAT/ACT prep (or any other projects you might have), you can begin to chip-away at the tasks. You don’t have to complete an entire project all at once, so choose a sub-task from your list and tackle it right away. Even if you don’t have multiple, consecutive hours to spend on a project, you can still work on smaller sub-tasks. Only have 15 minutes right now? Choose a sub-task that you can complete in that small time frame. When you have an hour or two later on, you can complete one of the larger sub-tasks or even multiple smaller sub-tasks. By initially breaking down your projects into lists of sub-tasks first, you can utilize any amount of spare time. Completing any task requires a certain level of focus. Many times, we end up making it harder for ourselves to focus by attempting to work on a task in a distracting environment. If you’re studying for the SAT/ACT while watching Netflix, texting friends, and lying on a comfy couch, it will be extremely difficult to fully absorb the material in a timely manner. Turn off the TV and put your phone on “Do Not Disturb” mode. Since couches and beds can make you feel sleepy, try to work at a table or desk and you won’t be as tempted to take a nap. It is important to be happy and comfortable in your working environment, but be on the lookout for any factors that are distracting or not conducive to productivity. When you can check off a task or project from your to-do list, be sure to reward yourself. Many students find it helpful to reward themselves after finishing a section of an SAT/ACT practice test. Sometimes, we reward students during tutoring sessions with a piece of candy. Think about a small reward that would make you feel motivated to continue working on additional tasks: maybe a piece of chocolate, an episode of your favorite TV show, or even a cup of coffee. Even if you’ve been prone to procrastination in the past, now is the time to break that habit. By avoiding procrastination, you’ll finish projects and accomplish goals sooner. 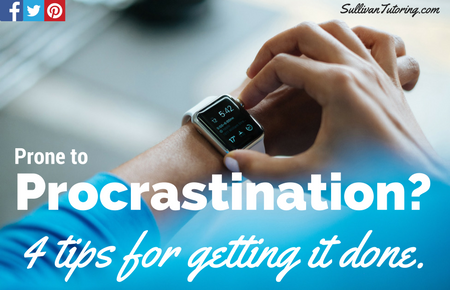 Leave a comment below and let us know how you kick procrastination to the curb! If the linear system above has infinite solutions, what is the value of a? A system of linear equations with infinite solutions consists of the same equation twice. Since 8 is double of 4 and 24 is double of 12, a must be double of 3 (so a=6). Text SULLIVAN to 42828 to receive our newsletter, Sullivan Scoop, which includes original articles, testing tips, industry news and important dates.